1986 was the real transition year. By the middle of 1986 PM&E pretty much was wrapped up, and our customers now knew us as Future Domain, the SCSI Host Adapter company. We still did customization for customers, but only as a part of selling host adapters and software. Now I felt it was time to increase our market beyond disk drive manufacturers to computer system manufacturers and system integrators. Several companies were making IBM compatible PC’s. The first ones I approached were Dell and Tandy at Comdex 1985. 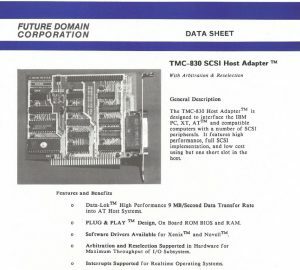 At that time IBM did not offer a SCSI host adapter so Dell felt they did not need to offer one either. Tandy on the other hand wanted to differentiate their product. After Comdex I flew to Texas and met with the Tandy marketers and Engineers. By early 1986 they decided to offer the TMC-830 card as an option for their TRS-80 line of PC’s, our product was now in the Tandy catalog. This was a major accomplishment because at that time Tandy was the largest PC compatible manufacturer. 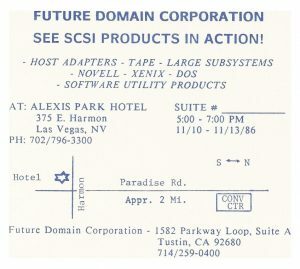 For the first time we exhibited at COMDEX 1986 as Future Domain, the SCSI Products company. We did not have a booth, but we rented a suite at the Alexis Park Hotel near the venue. By the end of 1986 I had closed many more disk drive manufacturers including Conner Peripherals, Quantum, Konica (for scanners), Control Data Corp., ALR (for PC’s), Western Computers, American Computers, Storage Dimensions, Kodak (scanners), LaPine and more. Sales quadrupled.